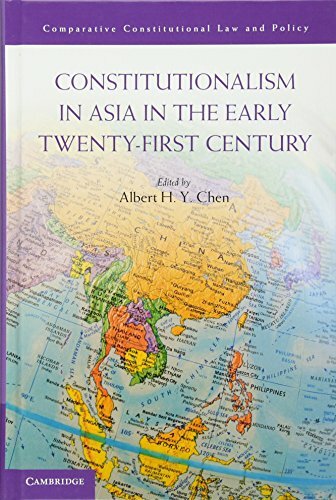 [PDF] Constitutionalism in Asia in the Early Twenty-First Century (Comparative Constitutional Law and Policy) | Free eBooks Download - EBOOKEE! Description: Examining developments in the first decade of the twenty-first century, this authoritative collection of essays studies the evolving practice of constitutional law and constitutionalism in Asia. It provides a comprehensive overview of the diverse constitutional issues and developments in sixteen East, Southeast and South Asian countries. It also discusses the types of constitutionalism that exist and the general trends in constitutional developments whilst offering comparative, historical and analytical perspectives on Asian constitutionalism. Written by leading scholars in the field, this book will be of great interest to students and scholars alike. No comments for "[PDF] Constitutionalism in Asia in the Early Twenty-First Century (Comparative Constitutional Law and Policy)".